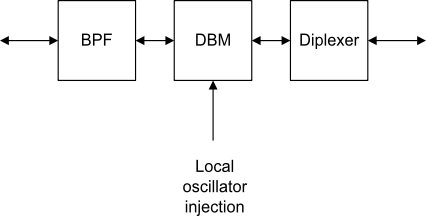 The following block diagram shows an example of a bidirectional passive mixer with RF selectivity and a terminating diplexer which should itself be terminated in 50ohms. The mixer may be a commercial type like the SBL-1, a home made equivalent using discrete diodes and transformers or a high performance type like the H-Mode mixer using FET switches instead of diodes. See elsewhere on this site for more details. It is suitable for both reception and transmission and may be used as a building block for more complex applications. This arrangement is intended for use in a low impedance - typically 50ohm - environment and is applicable to almost any frequency range. For the HF bands the band pass filter would need to be switchable for as many bands as were required using relays, analog switches or PIN diodes. For VHF operation the circuit would normally be used on a single band as switching is more difficult although still possible using miniature relays or PIN diodes. Note that relay contacts may require a small DC wetting current to ensure reliable operation at low signal levels. The manufacturer’s data sheet will provide information on the mixer insertion loss, correct amount of local oscillator drive level and maximum signal level. For the SBL-1 these figures are typically -6dB, 10mW (+7dBm) and 0.1mW (-10dBm) respectively. The diplexer is a mechanism to pass a chosen range of frequencies on to a following stage and also ensure that the mixer is terminated over a much wider frequency range. Insertion loss is typically 0.5dB and the diplexer must itself be terminated in 50ohms. The band pass filter should provide adequate attenuation of out of band signals including the mixer image frequency. The number of tuned stages will be determined by local signal levels, the frequency of operation and the IF - typically three would be used for HF band operation. The insertion loss of this filter will be determined by the quality of the tuned circuits, coupling factor etc but is likely to be around 3-5dB for three tuned circuits. See here for diplexer and mixer termination information.